Harrison Smith made his fourth Pro Bowl this season, but you can bet this young man cares a lot more about getting the Vikings to the playoffs than personal honors. Smith has to be one of General Manager Rick Spielman's top draft decisions. The Vikings took him 29th overall out of Notre Dame in 2012, and looking back you can bet there are a lot of teams disappointed they didn't draft him before that. I had a chance to sit down with Smith this week as he looks ahead to Sunday's game against the Bears. The Vikings can make the playoffs with a win, and if that happens, they probably will end up facing Chicago in the first round of the playoffs. Mitch Trubisky caused a lot of headaches for the Vikings when they lost 25-20 in Chicago on Nov. 18. Trubisky, one of the real rising stars at quarterback in this league, can make a lot of plays with his feet, as the announcers like to say. "He moves great," Smith told me. "They've got a lot of playmakers and they're doing a great job getting the ball to them. Guys out of the backfield. (Trey) Burton, the tight end. Receivers. Trubisky, yeah, he's very athletic. Can make plays happen with his legs and has the arm to get it out there. "[Scrambling], that's kind of when he's at his best. Kind of getting creative and extending plays. Running downfield." Smith doesn't expect much difference in the Bears offense on Sunday. "I don't know if they have different wrinkles, here or there. I'm sure they do. But, most of the same pieces," he said." 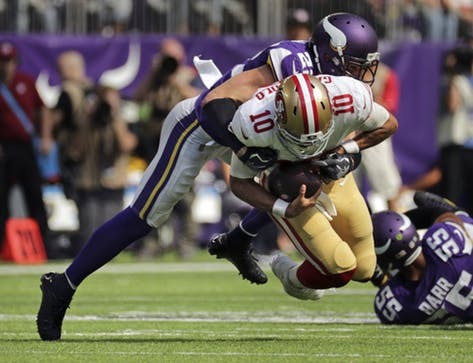 The Vikings have played well on defense the past few games, and part of that has to do with a certain Eric Wilson, who has filled in for injured middle linebacker Eric Kendricks. "He's a dynamic player," Smith said when asked about Wilson. "He's been great for us on special teams since he stepped in the door. Throw him out there on defense and it's the exact same thing." The Vikings have won six straight home games against Chicago, but struggle to win against the Bears on the road. "I guess we have trouble playing at each other's houses," Smith said. "No matter what, even if, I'm sure a lot of the wins here were close and a lot of their wins were close, so, they are always hard fought games." Yes, the Vikings should be favored to beat the Bears on Sunday. But that means the teams will probably meet again in the playoffs, in Chicago, and that game would be totally different. I think the Vikings are better in their own stadium, which is climate controlled. Playing outdoors in the cold and wind in Chicago would not be good. The Bears have a chance to get the No. 2 seed and a first round bye, so they will have something to play for. However, I don't think the Los Angeles Rams will lose to San Francisco. On the other hand, the Vikings, with a win, could get the No. 5 seed in the playoffs and avoid Chicago -- but for that to happen, Seattle would have to lose at home to Arizona, and there is no way the Pete Carroll-coached team is going to blow that one. But, as I always say, you never know what will happen.